I’m 64 years old, and I’ve tried so many “natural” skincare products that were supposed to be excellent for your skin, that help with fine lines/wrinkles, moisturize, and soften your skin, but I’ve never really been satisfied with the results, as they haven’t lived up to their claims, what the manufacturers promise. So, you can imagine my surprise when I bought several products of theCream skin care line, tried them out, and I remain shocked every time I use them, how they’re WAY superior to everything I’ve tried, and unlike ANYTHING I’ve ever used! 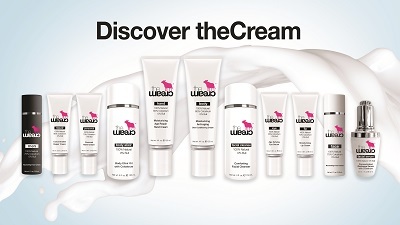 I’ve been raving about theCream line of skincare products to a number of my friends, to let them know I’ve finally discovered the “holy grail”, what I’ve been looking for for decades but never found anything that came close to this line! Most importantly, these products actually do what they say they’ll do, so my skin looks and feels AMAZING! And the icing on the cake~~ it’s truly toxic free, so it won’t harm my body in the long run. I only want to use the purest, gentlest and safest products on my skin, especially as I’ve gotten older, so the products I use must deliver what they claim, or I move on to the next, “promising” product line out there. What I’ve discovered, after looking further into the huge, well-known brand names out there, that they’re mainly hype, they don’t deliver… not to mention most contain a number of unsafe, additives. I’ve been searching for the best in that respect, as I’m very conscious about the unending number of bad ingredients that are out there, including untested chemicals and additives other companies add to their products. So ladies, if anyone out there sees this review, try this line for yourself, I just can’t praise it highly enough!! By the way, I have almost every product now – the face cleanser, the face moisturizer, eye cream, renew, and facial serum… hands-down, these are the finest products I have ever used on my skin! It feels like I’ve struck gold here but nobody else knows about the gold mine!! Check it out, it’s far superior to others I’ve spent good money on, only to have disappointing results once again. II guarantee you’ll NOT regret investing in the health of your skin by investing in these amazing products!